Tanner Ashmore as Mr. Incredible waving at adoring fans. If students or staff would like to see the band’s display, some upcoming events are as listed: November 10th Stockdale competition and Christmas parade on December 11th. Onlooker, Thalia Villanueva says, "The show is humorous, action-filled, and energetic." For years, the Taft Union High School (TUHS) band has put on a show for eager sports fans to enjoy during halftime. The talented students of TUHS strive for the best they can possibly do. 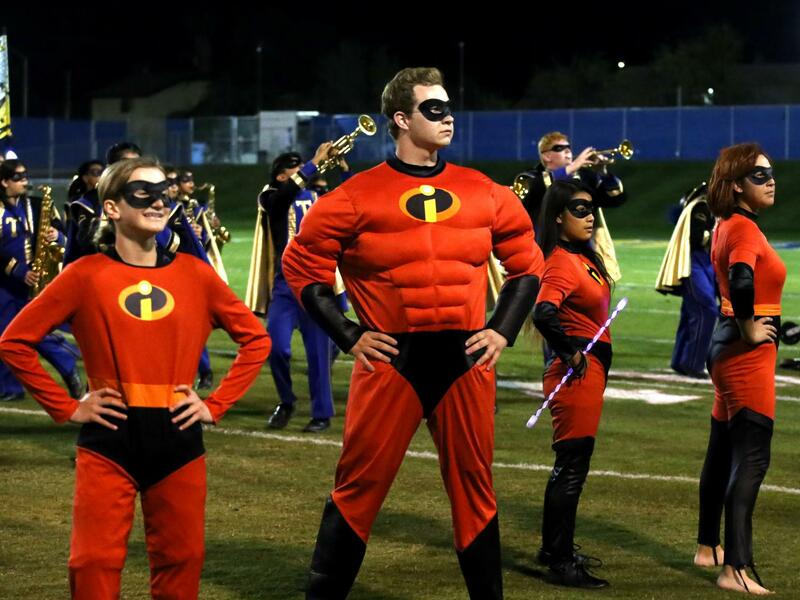 This year, TUHS musicians have decided to reenact the Disney classic The Incredibles. In their halftime show, the Incredibles family enjoys a picnic with a backdrop of a park behind them. While the family spends quality time together, the infamous Syndrome manages to kidnap the youngest of the family, Jack-Jack. When the family realizes their youngest child is missing, the family is quick to take action, chasing Syndrome around the field. When they catch up, the family bands together to defeat both Syndrome and Syndrome ’s brutal robot known as the omnidroid. After their epic battle, the Incredibles family is reunited. This incredible display could not have been so well executed without the talent of the TUHS student band. 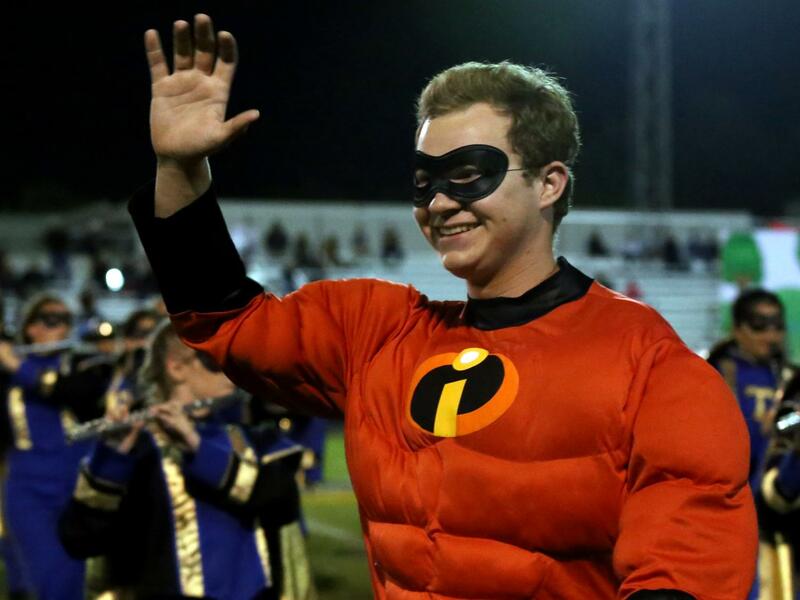 The Incredibles family was played by Tanner Ashmore(tenor drum) as Mr. Incredible, Ashly Ramirez (trumpet) as Violet, Reanna Rowland (flute) as Dash, Diana Huizar and Daniela Heraldez Sotelo (both clarinets) as Mrs. Incredible, Eulysses Urrea (mellophone) as omnidroid, and Presley Golling (bari sax) as Syndrome. Raygan Wescott (clarinet) painted the stage-setting backdrops with help from Chloe McAfee (piccolo). Dennis Posey (alto sax) is Drum Major and Nathaniel Morris (trombone) is assistant Drum Major. The solos were demonstrated by Dawson Lopez (mellophone), Luis Moncada (trumpet), and Dennis Posey (saxophone). At the Ridgeview competition, the band and colorguard placed first in music and second overall. Taft was well represented and accomplished an incredible feat. Last Saturday, the band went to Fresno State to compete against seven bands in their division and see the Fresno State band perform. It was an amazing experience for the band. The band will have their very last performance in Stockdale on Nov. 10.